Charleston’s next mayor is left at the altar, picked up by a girl who’s come back home after six years. 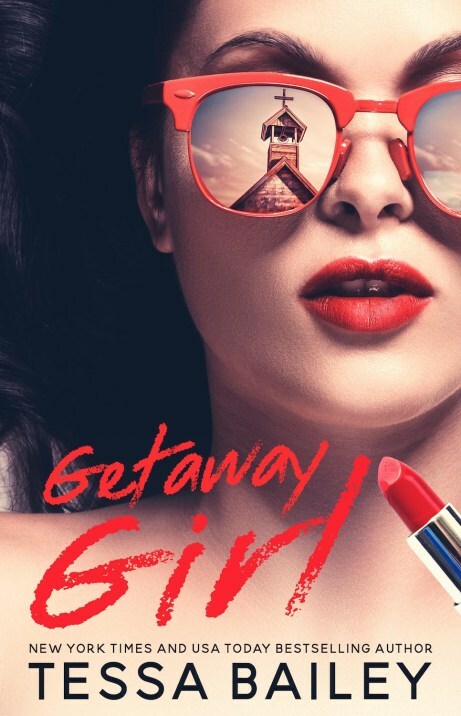 He’s the face of the elite, she’s the girl with the scandalous last name, and together, chemistry burns up the pages of Tessa Bailey’s GETAWAY GIRL. This was such a fun, fast-paced book to read. Full of wit and heart, as well as a whole lot of sexiness, I devoured the unlikely story of Addison and Elijah. I relished in their banter, in their easy friendship, in the longing for and rightness of each other. Addison Potts returns to Charleston and her first stop is her cousin’s wedding. Murmurs start to rise at her arrival but quickly get replaced with shocked awes when the bride leaves the groom at the altar. Elijah—the now jilted groom—is the future mayor of the city, his life meticulously planned to the minute. Walking out of the church, he didn’t expect a girl to offer him a way out of the situation he’s found himself in, open car door and bottle of liquor in hand. Addison gives Elijah unexpected respite from the craziness of his life and they soon become best friends… in secret. She’s exactly what Elijah needs—someone to hold him accountable, who doesn’t care about his status or last name, who simply wants to spend time with him. As his election nears, their friendship wades into less familiar territory, emotions and desires deepening into something barely contained. Addison (and her family history) would surely stir public opinion, potentially costing him the election and the very real dreams he has for the city he loves. But once Elijah realizes just how much he needs her, he’s not willing to keep her hidden any longer, politics be damned. Trouble is, fate and family can often play a cruel hand and it may be too late for them both. This delightful friends-to-lovers story is a great one to get lost in, to relish in and quickly devour. The banter was one of my favorite parts, making their chemistry and charm come to life on the page. Pack this one in your pool bag, you’ll be smiling brightly in the sun. Who has Elijah been kidding? He preferred my dusty, cluttered Christmas-themed apartment to this place? This…millionaire family man’s respite on the water? No. No, he’s been avoiding his life. Back in his office, I had the fleeting realization that Elijah had been staying with me—in year-round Christmas—to avoid reality. And what happened with Naomi. That theory cements itself now. Hard. He’s been hiding away with me. I’ve been giving him an excuse to hide. A place to do it. This is where he belongs. Not with me. My vision blurs as I close the door behind me. With the click still hanging in the air, I slump into a cross-legged position on the floor. Beneath my fingertips, the floor is smooth and rich, even through a layer of dust. This place is unfamiliar to me, yet I don’t feel like a stranger. Because it’s so Elijah, right down to the masculine class and robust ceiling beams. It’s a false sense of comfort, though, because he can’t have this place and me as a friend. It was easy to pretend in my out-of-the-way two-bedroom, but this? This is a life to be embraced. There will be a wife and kids in this place one day. There might even be a chance for Elijah to win back Naomi. But not as long as I’m spending time with him. Causing people to whisper about us and speculate. Allowing him to avoid his future. I’m hurting him. I have to let him go. But not before I fix everything.